Vessel Placards is the leader for custom items such as placards and other in-house manufactured accessories. Our team has a reputation for building highest quality products and designs that enabled us to grow and become the leader in the marine industry. We are a market leader for high-quality documentation number plaques at affordable prices. You can choose from our wide array of custom products and stock marine plaques. 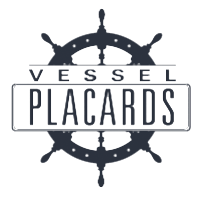 Vessel Placards is not the same as the big chain stores as we concentrate on providing our clients with specialized products and services. We have extensive knowledge and experience of the products and services that we offer. We also make sure that our customers are satisfied by giving them the highest quality service that we can provide. Our customer support team is ready to assist you in case you need advice or help in choosing the right materials for your placard. If you are not sure whether or not we offer the documentation number plaque that you need, please email us at info@vesselplacards.com. We will respond to you promptly. How To Attach The Plaque To Your Ship? We recommend that you consult this information to the US Coast Guard requirements. The plaque you ordered from us is provided without mounting holes. You may also use permanent epoxy. How Long Before You Receive Your Order? We can give you an estimate of up to seven days from the day you place your order. The reason for this is that we produce and ship plaques on a first order in and first order out basis. We love giving our customers cool designs and plaques. As we improve our site, we are committed to providing you with creative parts at a more affordable rate than the prices given by big retail stores. When you place an order, you may wish to send us an email to help us better understand your plaque needs. You may leave your phone number or email address and choose the best time for us to call or email you. Or you may decide to message us and describe the kind of plaque that you are interested in having us create for you.